Valiant Wings Publishing has made themselves into an excellent provider of detailed documentation of aircraft. It's difficult to believe they've "only" been around for ten years but most of their titles have progressed to be considered the "bible" on the aircraft covered. 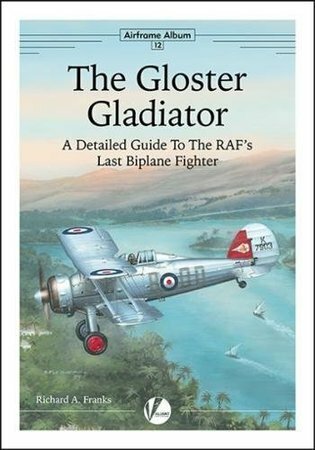 While I don't have any other reference on the Gloster Gladiator, I consider the information the book presents to make it the "bible" of this particular aircraft. If you have any interest at all in the type then I believe you're doing yourself a disservice by not picking up this reference. If you're a 1/72 modeler and was hoping for a Libor Jekl build of the excellent Airfix kit, you won't find it here because he already built one in his book Airframe Workbench Guide: Aircraft Modelling. Instead, Steve A. Evans provides an excellent build of the 1/32 Silver Wings kit. Remember this series of titles from Valiant - Airframe Album - concentrates on the actual aircraft itself and isn't one where model builds are a primary point of the book. Any build added to these pages can be considered a "bonus". If you are a modeler and was hoping for color plates, this title will not disappoint at all. In fact, the profiles provided by Richard J. Caruana run the full gamut of Gladiator operators. There is plenty of motivation within the color plates to build lots of Gladiator models. Note: if you are a 1/72 modeler be aware that S.B.S. Models has announced a set of photoetch rigging to fit the Airfix kit. Couple it with their already released engine and two wheel sets (and not just one, but two Finnish decal sheets, along with their Swedish decals) and you'll have a superlative model added to your shelves. Huge thanks to Valiant Wings Publishing for sending this title to review. I really do appreciate it!